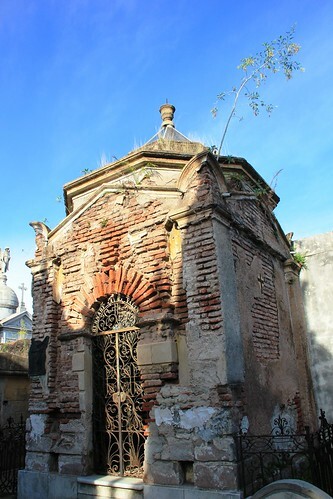 Cemeteries in South America are fascinating. They tend to be above ground in spaces that range from basic slots in a big wall, to insanely elaborate family mausoleums that resemble miniature mansions, churches, or temples. To wander around in them is like being in a very tiny city. 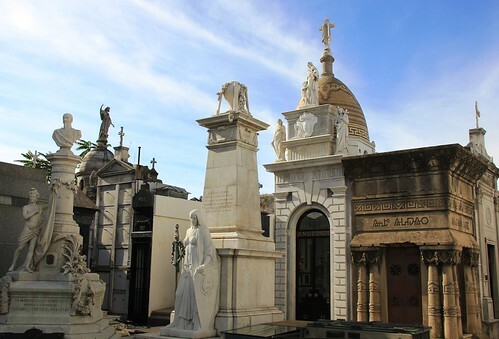 One of the most elaborate cemeteries we’ve visited is the Recoleta Cemetery in Buenos Aires, Argentina. It’s an actual tourist attraction and is where Evita was laid to rest, along with a slew of other notable Argentinians. As we wandered though this little place of the dead, a few things became very apparent to me. 1) There are a lot of tombs where either there is nobody left to pay the maintenance fee, or the family can’t afford to pay it anymore. 2) Nobody seems to care, or do anything when these tombs start literally falling down. There were a number of mausoleums where the glass on the windows or doors were broken, and a few where the ceilings had caved in completely. This makes it a whole lot easier to see the, erm, contents, of the structure. 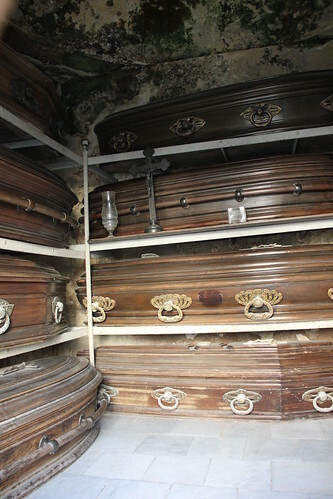 I am a bit unaccustomed to seeing stacks of coffins, so when I peeked into the windows of a disheveled tomb and saw this (below), I was a little taken aback. I don’t know what I expected was in these things, but I was still surprised to see so. many. coffins. The other thing was that they are all just there on like a bunk bed for the dead. Morbid, I know, but after many nights in dorm rooms I just can’t think of another way to describe it. Now, if you already know me, what I am about to say won’t be that surprising. If you have never met me, well…sorry, you’re about to meet a little bit of my supernatural crazy. It wouldn’t be very difficult at all for a zombie to pop the lid off a coffin that’s just laying about in a mausoleum. In the States, they’d have to work against all that topsoil and it would take them forever to get out. In Buenos Aires, it requires hardly any effort! Justin tried to point out that they’d still be all in their little marble houses, but then we started realizing that actually, a lot of those aren’t so secure. Take this one for example. It looks like it was originally built to be solid. I don’t really know what’s happening with the door, but clearly it wouldn’t take much to unhinge it completely. 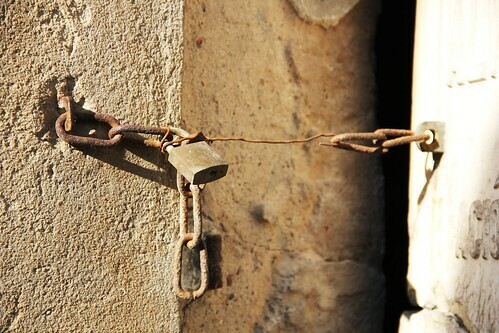 Let’s take a closer look at the “lock” now. Yeah, that’s not going to restrain the power of the walking dead. I’m just saying. 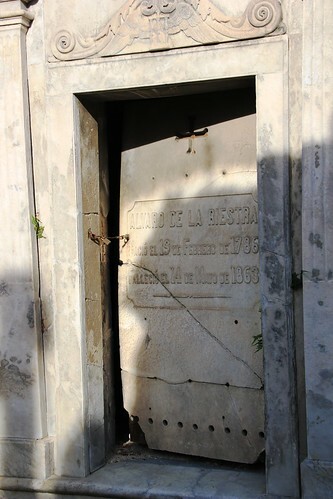 There were tons of tombs that had this problem, and we quickly came to the conclusion that we don’t want to be anywhere in South America when the zombie apocalypse occurs. In the meantime though, these cemeteries are incredible little microcosms of architecture, and you should totally go check a few of them out if you get the chance. 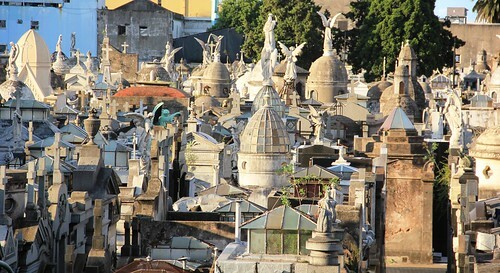 The best we’ve seen are the Recoleta Cemetary in Buenos Aires, Argentina, and the Cementerio General in Santiago, Chile. Bryan is very jealous of your pic of all the tops of the Recoletta Cemetary! Great pics! I was thinking that those mausoleums looked like dead people hostels, too. Creepy! Dead people hostels! *snort! * I shouldn’t be laughing…but it’s funny! 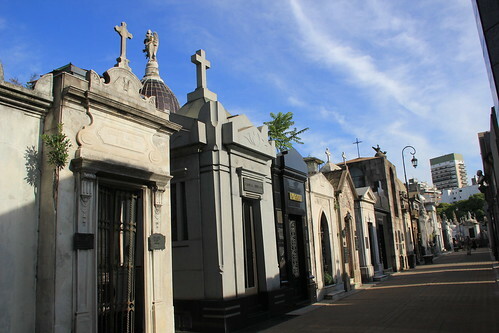 Ashley, these are awesome photographs of Recoleta. I’ve been there (1996) and it is really an unbelievable place. Hope you blew Evita a kiss!